I've been meaning to track this thread down but have kept forgetting, so tonight I found it. Just through the first 8 to 10 posts, but it promises to be an entertaining read. Least interested I've been in a SB since 2005. 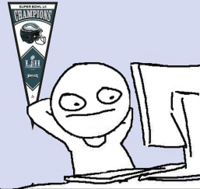 Hate the pats, but refuse to cheer for the Eagles because of their disgusting fan base. I just hope something happens that forces the NFL to put officials under a microscope. Our last glimpse of football in a longggg time, boys. Gotta cheer for NE, because I don't want Philly getting a ring before us. With that said, no way I want the Eagles to get a Lombardi before the Falcons do. Pats getting one more will not hurt any more than the SB loss last season. Wow. They would rather the team that came back and spanked them to remain champs another year than have the eagles unseat them? The hate is strong! Love it!! Well the’ll get their opportunity against the eagles this coming season in Philly. Yeah, I find it very amusing that a good number of them didn't us to 'get a Lombardi before them', as if having a 3 time NFL Championship franchise winning a Super Bowl Championship before a 0 time NFL Championship Franchise, who up until a few years ago had never had back to back winning seasons in their entire existence, is the biggest insult that they could ever suffer. have to say, for as many that were rooting against philly in the beginning by half time almost if not all were rooting for us. I don't tend to go to a lot of other teams boards, unless there's a fun reason like now, but when I have been on other boards, there's a universal disdain for Collinsworthless. lol Yeah, I looked (briefly) for one on the Torrey Smith trade, but didn't see one. Some of them apparently wanted Bennett and didn't like that we got him. matter of fact, i was there in '98 when the went to they went to thier first super bowl and you would never have even known they were going. it was that low key. in all fairness, had we not made the SB,. I would have been cheering for the Patriots too. Like one them said, it doesn't really hurt anyone if the Pats keep winning them. I would never root for a team to win one before us. I like(d) the Vikings but if they made it to the SB they would have beat us and I would have been bitter about that. I think the lone exception in God knows how many years was I rooted for the Seahawks the year they won, but that was mostly to spite 49ers fans. why can't it be august? i want more football. that's fair. I find it difficult to watch any type of sporting event and not start favoring one team over the other. The sense of competitiveness overtakes me and I start hootin' and hollarin' for one team or the other. For me, if I hate both teams, I root against both teams. I don't remember specifics of the games, but say for instance Eli threw an INT in Super Bowl XLII, I laughed and was glad to see it. If Brady fumbled on a sack, I laughed and was glad to see it. If Rodney Harrison got burned, I laughed and was glad to see it. If a Giants CB got burned, I laughed and was glad to see it. If... well, I think you see my direction here. When the game was over, I turned it off quickly so as not to dirty myself by seeing confetti and Lombardi Hoisting. 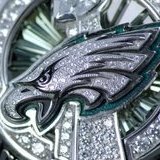 In a case like that, there is no way for an Eagles fan to 'win', so be happy at both teams misery and both teams mistakes and when the game is over, be pissed that the winner won and happy that the loser lost and then scrub the entire experience from your memory as if it never happened. Now, that's the appropriate way for an Eagles fan to behave but there's NO excuse for those lousy, stinking Falcons fans for not rooting for the Eagles! Ever since we lost to the Pats, and spygate became a thing, I've always rooted against the Pats in super bowls. I've only rooted for the Giants twice in my life because of this. If we had lost to ATL, and they had made it to the SB this year, I would've rooted for them. Heck, I rooted for them last year, and when they lost I just laughed my *** off. I could've cared less about teams getting a SB before us, as I just wanted to see the Eagles win one in my lifetime period. I'm really glad I got to enjoy the win with my family, and friends. How do you recover from 28-3? I don't think I could ever root for the team that came back and beat mine in the Super Bowl like that.... Until now I didn't notice any of the shade coming from Atlanta. They were nothing like the crybabies from Minnesota. After the Patriots beat us in the Super Bowl and was caught cheating, I was was definitely rooting against the Patriots in all those Super Bowls... But I will never admit to rooting for the Giants. But when it comes to super bowls, I have one thought, anybody but the cowpies. I can deal with even the giants, redskins, patriots whoever......but never, ever the f----- cowpies.